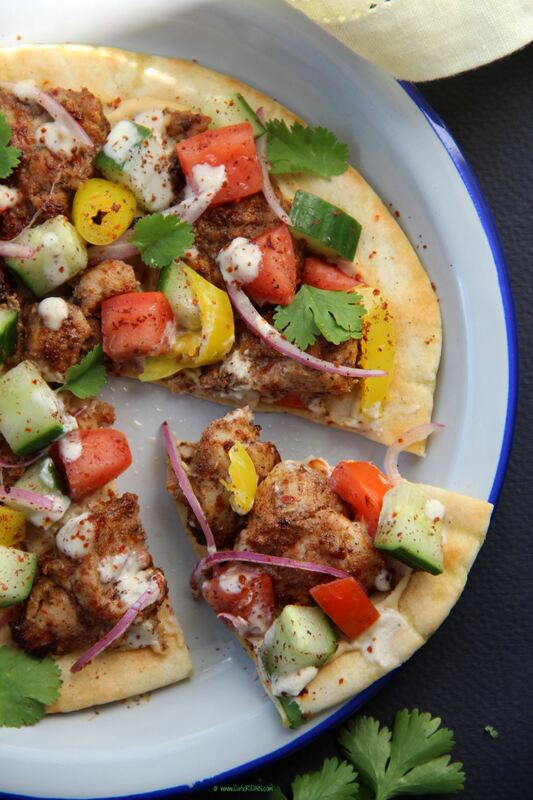 This Lebanese inspired pizza is nutritious, delicious and super easy to put together. 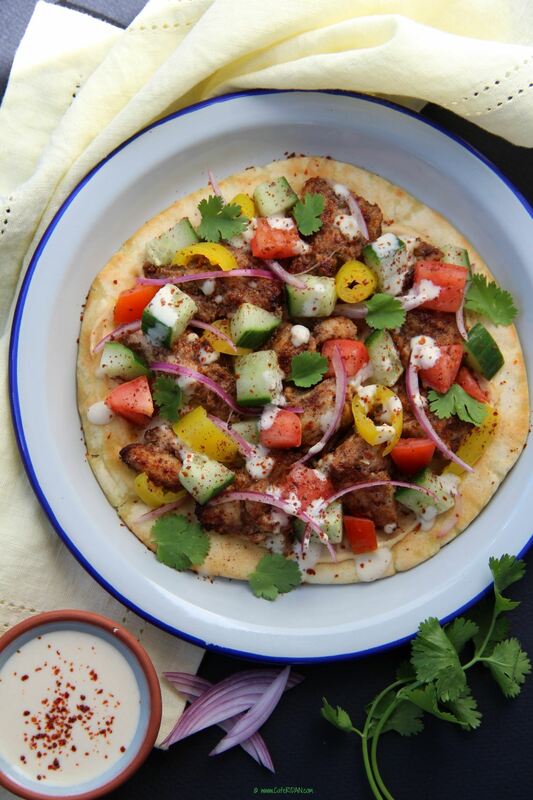 Middle eastern flat bread layered with hummus, topped with moist and flavorful chicken shawarma, cucumbers, onions, tomatoes and banana peppers. I top this pizza off with a lemony tahini sauce, sumac and Aleppo pepper. Every bite is packed with flavor! For the chicken shawarma I use a ready spice mix but you can make your own too. This dish is very versatile and adaptable depending on what vegetables you have on hand. Bell peppers, pickled radish, cherry tomatoes, lettuce or arugula are great on this pizza too. Cut into small triangles, it serves as a delicious appetizer. If you cannot find sumac and Aleppo pepper you can use chili flakes instead. Mix all the marinade ingredients together in a bowl. Add the chicken thighs and mix well. Cover and refrigerate for 4-6 hours or preferably overnight. Heat a griddle on medium heat and add the chicken. Cook for about 10 minutes until the chicken is cooked and slightly charred. Remove from heat and set aside. I also use my Philips air fryer to make the shawarma. I add the marinated chicken to the basket and cook for 15 minutes at 360 degrees F.
In a bowl mix all the ingredients together until well combined. Add a little bit more water if the sauce is too thick. Brush each pita lightly with Extra virgin olive oil and sprinkle with salt and pepper. Heat the pita on a hot skillet for 2-3 minutes a side until slightly brown and crisp. Remove from heat and spread a tablespoon of hummus on the pita. 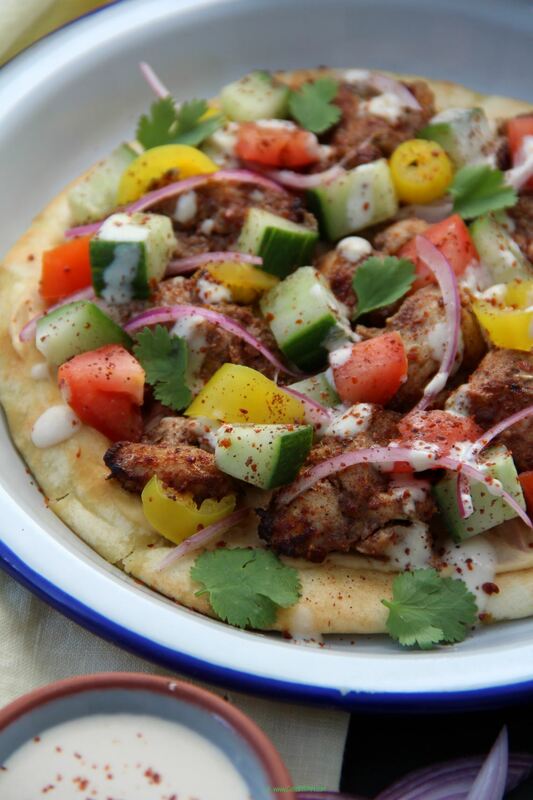 Top the pita with the chicken shawarma, cucumbers, tomatoes, red onions, banana peppers, cilantro. Drizzle the top with tahini sauce and sprinkle some sumac and Aleppo pepper. Cut and enjoy!